Hachigo's plan targets design, performance and more Japan exports for N.A. TOKYO -- Honda Motor Co. President Takahiro Hachigo, still battling quality problems after nearly a year in office, aims to strengthen the company’s production footprint, streamline r&d and focus more on electrified cars to reboot the automaker. Under the comeback blueprint unveiled Wednesday in Tokyo, Hachigo previewed plans to export more vehicles from Japan to North America and Europe to take advantage of slack capacity at home. Hachigo also said he will create new positions at the base of product development with the sole purpose of developing more exciting vehicles. The new positions will focus on overall product concept and such areas as performance and design. He also set a bold electrification goal to derive two-thirds of Honda’s global sales from green vehicles such as hybrids, plug-in hybrids, fuel cell vehicles and electric vehicles by 2030. That’s up from a paltry 5 percent of worldwide sales today. The overhaul’s objective will be creating a nimbler company through more integrated global operations and a revamped r&d process more focused on products that evoke Honda’s glory days when the brand was envied for its cutting-edge cool. Honda’s effort to build a global network of six regional production and product development hubs overburdened support activities from Japan, Hachigo said. Hachigo’s predecessor, Takanobu Ito, introduced the strategy and put Hachigo in charge of setting it up. Hachigo said the system will stay in place but needs to be tweaked for clearer lines of responsibility and delegation. When Hachigo took the helm last June, he inheriting a company from Ito that was reeling from a series of blows. The Japanese carmaker’s reputation, long envied as innovative, had slumped into ho-hum territory, with critics saying some recent products failed to stand out in the mass-market crowd. The carmaker has also been hit with a string of embarrassing recalls of the redesigned Fit small car in Japan that forced Honda to delay several product launches and overhaul its r&d strategy. The problems have carried into Hachigo’s tenure, notably with this year’s stop-sales order on some redesigned Honda Civics to fix a piston ring problem that can cause engines failure. Honda embarked on a revival program to slow down and improve product development while strengthening the integration of the company’s far-flung regional operations. Hachigo has also prioritized going back to basics to engineer more exciting cars. But the problems with the 2016 Civic, which won the North American Car of the Year Award in January, shows how tough the makeover can be. Hachigo largely sidestepped comment on the Takata airbag problem, saying that the company’s top priority is determining the root cause of the failures and accelerating the replacement of airbags. Even though Honda is Takata’s biggest customer and a minority shareholder, Hachigo added that the company wasn’t planning to provide any financial aid to the troubled supplier. “I don’t think Honda will be doing anything on its own,” he said. Hachigo outlined the new strategic direction a day after unveiling sweeping management changes to inject fresh blood into Honda's top executive ranks and put his personal stamp on the company. As part of the overhaul, Hachigo appointed new people to key roles in charge of r&d, North America and automotive operations. The changes clear the top ranks of some prominent older-generation executives who served under Hachigo’s predecessor, Takanobu Ito. The reorganization must still be approved at the company’s annual shareholder meeting in June. Taking charge of North America will be Toshiaki Mikoshiba, 58, who formerly headed Honda’s European operations. Yoshiyuki Matsumoto, 58, will become head of the carmaker’s quasi-independent development company Honda R&D Co. He now oversees the company’s automotive business. 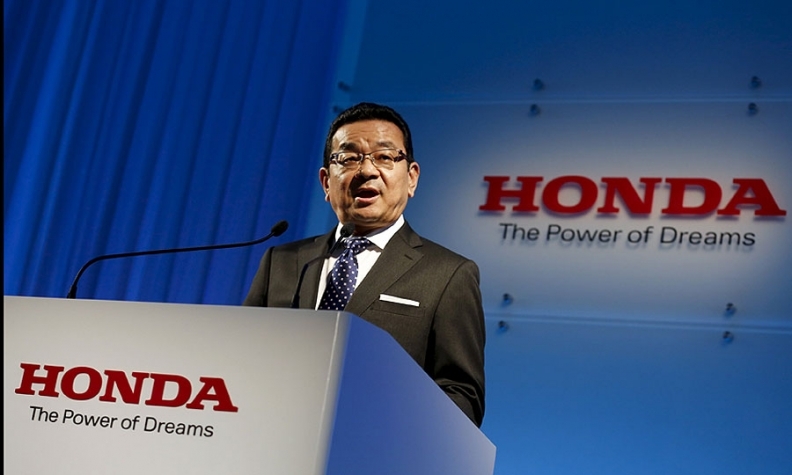 Takashi Sekiguchi, 57, will lead Honda’s automotive division. Sekiguchi was previously in charge of global automotive sales strategy and automotive programs covering such vehicles as the Accord, Civic and CR-V. In terms of streamlining global production, Hachigo said he wants to soak up extra capacity in places such as Europe and Japan by having them export more cars to other markets. Europe will be the export hub for the new-generation Civic hatchback that will debut at next week’s Geneva auto show. Japan, meanwhile, may also begin shipping Civics and CR-V crossovers to North America, after beginning exports of the Fit to North America last year, he said. Japan will also export the CR-V and HR-V compact crossover to Europe. Canada, which currently ships the CR-V to Europe, will cease those exports and target production at North America. Finally, to better tap booming demand for crossovers in North America, Honda will add production of the Acura MDX to its plant in East Liberty, Ohio, in 2017. That will come in addition to MDX output already coming out of Honda’s Alabama factory.